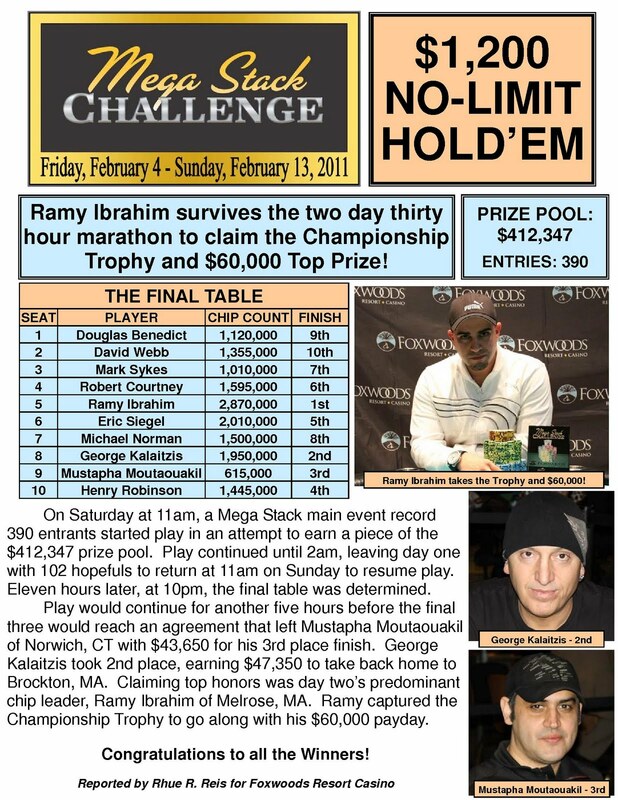 Ramy Ibrahim - Foxwoods Mega Stack Main Event Champion! The final three players in the Foxwoods Mega Stack Challenge Main Event came to an agreement on an equity chop. Ramy Ibrahim is officially the champion and takes home the trophy as well as $60,000. Henry Robinson moved all in before the flop and was called by George Kalaitzis. Robinson held [Ac][Jd] to Kalaitzis's [Kd][Ks]. The board came out [9s][7d][2d][5s][2s] and the kings of Kalaitzis held up. Henry Robinson was eliminated in 4th place for $32,000. Eric Siegel got all in before the flop with [Kc][Jh] and was called by George Kalaitzis with [Ah][Qh]. The board came [7d][4c][4d][5c][Qc] and Kalaitzis pair of queens took the pot. Eric Siegel was eliminated in 5th place and takes home $29,531. The blinds have been increased to 50,000-100,000 with a 10,000 ante. The average chip stack with five players remaining is now 3,120,000. After being crippled by Henry Robinson a hand before, Bob Courtney has been eliminated in 6th place by Mustapha Moutaouakil. Courtney's [Ad][8h] was not able to hold against Moutaouakil's [Qc][Js] when the board came [Ac][Ks][4d][Ts][6h]. Bob Courtney takes home $25,000. The board came [9c][9h][2c][9d][As] and Ibrahim's queens held up to win the pot and eliminate Sykes in 7th place for $20,000. Blinds are being increased to 40,000-80,000 with a 10,000 ante. The board ran out [Jc][Ts][7s][Ad][6s] and Kalaitzis improved to a set to win the pot. Michael Norman was eliminated in 8th place and takes home $20,000 after the save agreement. The board ran out [Js][9c][6c][9h][8d] and Ibrahim improved to a full house to eliminate Benedict in 9th place. The final nine players came to an agreement on a save before Benedict was eliminated and his official payout for 9th is $20,000. The blinds have been increased to 30,000-60,000 with a 10,000. The chip average is 1,734,000.